Sometimes the price of journalism is steep and hefty, but if you want to deliver the information and stories that people care about you can't expect it all to be glamorous. Now that Halloween has passed us by, I experienced something that many of us probably already have, but never really put much thought into it. Well, if there is anything I do well, it is putting way to much thought into something that probably doesn't deserve it. Daily things pass through my mind of such inquisitive nature like, "How come we can't taste our own tongue?" and, "What would life be like if horses were carnivorous?" Too many times have folks just scoffed at those ideas, but this time I stumbled upon something that people cared about. This time I found something that really resonates within all of us Americans, and actually, even with people abroad. If there is anything that we find importance in and love, it is food, snacks, treats, and yes, Reese's Peanut Butter Cups. Now, like I said, Halloween has passed and thus I had not one, but two different kinds of Reese's Peanut Butter Cups within reach, and I had a choice to make. Would I eat the large or the minis first? I instinctively grabbed for the minis. Why? What was it that might cause me to do such a thing? Well, science may have prevailed... sort of, and I just might have an answer. After having a few days of having minis it became harder to find them. 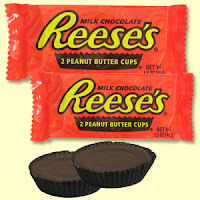 I remember that a good friend had given my wife and I some candies and therein were some large Reese's Peanut Butter Cups. I rejoiced and made them part of my chemical makeup. Sure, they were still fantastic, but something was wrong. Something was amiss. I couldn't put my finger on it but somehow, someway, they tasted different. Was it a good different? No, not really. Was it really bad? No, not at all. They were still fantastic, but they just weren't as fantastic. What could it be? They were still fresh and in fact started to melt to the touch. No, there wasn't really anything wrong with the quality of them and they definitely tasted the way I expected them to, but somehow the minis were better. I thought I was mad, insane, and going nuts, but then I posted a question on the Entertaining Evil Facebook Page and three out of the three people who responded and gave their opinion felt that yes, the minis tasted better. A friend of mine also asked his Facebook friends and the answers had more variation, but still were largely for the minis. While I trusted their opinions, I took the debate to a higher playground, some place where I knew I could poll hundreds around the globe and get some instant gratification... Twitter! In total, the ratio boiled down to 11:5 in favor of minis. Why? Well, here is where it gets interesting. 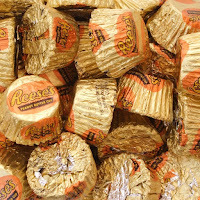 Some find that the quality of the chocolate in a Reese's isn't so fantastic, so the flavor of the peanut butter really comes out more in the minis. Personally, I agree with that statement. They also like that since it is smaller it feels like they are killing themselves a little less. Ironically enough, those that prefer the larger say that they like that there is more peanut butter, but is there also not more chocolate there too? Yes, there are still more questions, but it seems like in a world torn by wars, violence, racism and hate, even if we disagree on what size of Reese's Peanut Butter Cups we prefer, we can still agree to love them in general.